Casablanca. This city is famous all over the world in connection with the same film. In fact there is little romance: the most populous city in Morocco (almost 3.5 million), industrial and commercial center, and a large international port, Casablanca is amazing in its scope. This city is worth a visit not only to familiarize with the culture, but also for shopping – there are tremendous fairs. 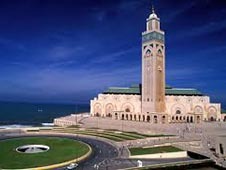 Be sure to see the tallest minaret in the world (200 m) – it is part of the Mosque of Hassan II. The international airport of Casablanca named Mohammed V is considered one the most beautiful in the world. It is located quite far from the city, and indeed the Casablanca did not have to walk on foot, and local transport runs frequently crowded. The best option to move in this case have a car. It can be rented directly at the airport of Casablanca. Select the desired type of car and save considerably by pre-booking you can with the site bookingcar.ru. To rent a car, you must be aged between 23 and 60 years and the driver's license of international standard. Sometimes you can get a car and national rights, but keep in mind that the police likes to stop foreigners and to impose fines. Always remember the main rule - they are the same as in Europe: pristegayte seat belts, do not talk on a cell phone while driving, observe the speed limit. With low beam ride is not accepted. If you included the habit, you will be flashing - in a way drivers suggest that the lights are lit and you need to turn them off. Signals here permanently, especially when you switch the red light. Movement in Casablanca - the most extreme and unpredictable throughout Morocco, so drive carefully. In Casablanca, a lot of gas stations, the exception - Medina district. Call in there by car is impossible, although road sign on this. You can buy any kind of petrol and diesel and gas. The cost - about $ 1 per liter of fuel. We accept both cash and credit cards. The city has opened and closed parking, every one paid. Provided as hourly and daily parking. The price of parking - usually 10-20 dirhams. Free parking can be found near the hotels and restaurants, and even then not always. For assistance in parking the car taken to the employee one dirham. You will need it, because the parking lot mostly crowded. Police loves to penalize foreigners. Calculate them easily - local drivers go mainly on Mercedes 80s. Rather than on foreign cars. Do not take the example of other drivers and a better ride, observing all the rules, or you can put a fixed fee - 400 dirhams (about $ 40). It will be the same for all kinds of offenses.